Springdale, Pa.-based R.I. Lampus Co. has strengthened its leading stake in western Pennsylvania concrete block and hardscape unit production, acquiring A.A. Robbins Co. of Cambridge Springs. As reported by Pittsburgh-based Total Trib Media, the buyout of retiring owner Denny Robbins adds a Crawford County plant to Lampus’ Allegheny, Beaver, Erie and Lawrence county sites, and dovetails a recent brick distribution and retail showroom expansion. 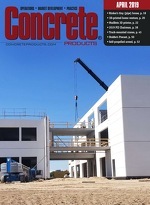 Wells Concrete Products is working with the Minnesota State University, Mankato, to develop a curriculum focused on precast and prestressed methods for civil engineering and construction management students, the Precast/Prestressed Concrete Institute notes. A Wells Concrete and PCI grant enabled the “Building a Concrete Future” program launch.